We are the manufacturer of Heavy Duty Pallet Racks. The best solution for various palletized loads storage. 1. Quick locating of required loads. Maximum load capacity per shelf. 2. Maximum use of available storage space .Height between layers is adjustable according to goods size, Multi-purpose flexible. 3. Direct access to any pallet, easy control of stocks. 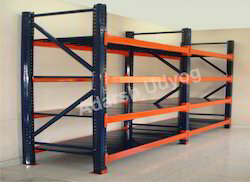 ADARSH UDYOG is manufacturer of all types pallet racks, which makes your workplace convinient and add space for storage, we provide light and heavy duty pallet racks as per your needs and requirements. Pallet storage rack is offered in many different configurations to fit every size and every budget. Pallet storage rack can be used for a variety of storage applications. 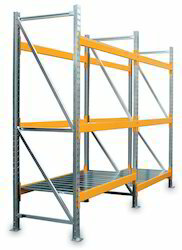 Looking for Palletise Racking Systems ?